a historical phase of UGA football. On this day of celebrating our great country's independence, I thought it would be appropriate to post something regarding a "patriotic" aspect of our great UGA football program, which unfortunately often gets ignored, although it should be a rather significant part of Bulldogs history. 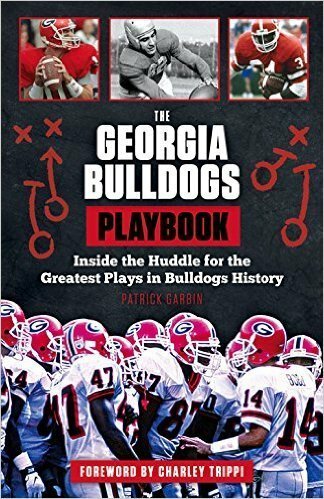 Likely the most noteworthy association or connection concerning such aspect has hardly been mentioned before in Georgia football lore—only a mere mention in a simple, photo-heavy book from nearly a decade ago, at least from what I could find. Not even the autobiography of one of the two Bulldogs involved refers to the historical connection. 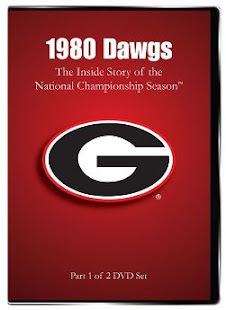 According to the autobiography's coauthor, it simply just wasn't mentioned by the UGA football legend during their hours and hours of interviews. The particular phase of UGA football I'm speaking of is from the late summer of 1943 when 25 Georgia players, five assistant coaches, and one trainer had been assigned to the U.S. Armed Forces to serve our country during World War II. Not all of them would return home alive. 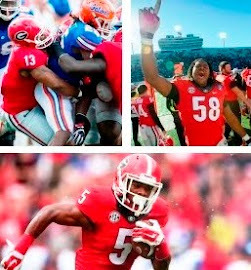 The UGA football "connections" I speak of his how a number of these Bulldogs would ironically cross paths again on the gridiron, or connect for the first time, by way of the military bases they were stationed. During World War II, the U.S. military and colleges joined forces, fielding top-level football teams consisting of active duty military personnel, which played against college, professional, and/or other military squads. Many former Georgia players and coaches, some of which would return to the University following WWII, were members of service teams for the 1943, 1944, and/or the 1945 season. Still, and as indicated, this chapter of UGA football is essentially neglected, including by the Georgia football program itself which seemingly has no idea the extent of its player/coach participation in military games, and has not even shown any interest in this aspect of our football history. However, there is at least one "Bulldog" who has a tremendous interest in this chapter of UGA football. My friend George Suddath is a native of Athens and a UGA graduate. His father, "Epp", moved to the Classic City in 1932 to open the downtown Varsity. George began selling programs at Sanford Stadium in 1957 and has been a collector of UGA memorabilia ever since, including, and get this, owning around 900 programs of the roughly 1,200 football games the Bulldogs have played in their history. Among the many, many UGA programs, tickets, books, guides—you name it—he also owns nearly 50 programs of WWII service games which Georgia players participated in. But, it's George's wealth of knowledge on the subject which might be the most impressive. As I blogged about in one of my very first posts, while Georgia's football program became depleted upon the U.S. military and college teams joining forces, other college teams flourished. The V-12 officer training programs of WWII allowed schools hosting the programs, like Notre Dame, Michigan, Purdue, Duke, and Georgia Tech, to collect players from other schools, essentially creating pooled all-star teams. 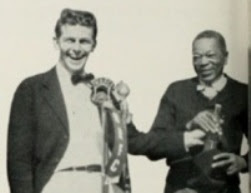 For example, players from Georgia's 1942 national championship team, Jack Bush and Garland "Bulldog" Williams, were whisked away from Athens and reunited in Durham, NC, at Duke University, where they played together for the 8-1 and 7th-ranked Blue Devils of 1943. One of my favorite accounts of the reuniting of Bulldogs via the military was when Georgia's Leo Costa (1940-1942), the school's first great placekicker, led Jackson (MS) Air Force Base as its head coach to a 10-0 victory over Ole Miss in Oxford. The Rebels, on the other hand, were head coached by the reputable Harry Mehre—Georgia's head man from 1928 through 1937. Also from 1944, there's the story of short-lived-Bulldog George Young, who I regard as one of Georgia's all-time transfers. Young was a standout on the Bulldogs' freshman team of 1942, who never played on the UGA varsity, but would eventually be a member of the Cleveland Browns for eight seasons. He played for the renowned Great Lakes NTS squad of '44, whose victories included wins over Purdue, Northwestern, Wisconsin, and a 12-10 decision over the Third Air Force Gremlins, led by a former teammate of Young's—the acclaimed Charley Trippi. Even though the war in Europe ended in May 1945, and against Japan in August 1945, many Bulldogs played on service teams for the 1945 season, or at least part of it, as was the case for arguably the greatest Bulldog football player of all time. Going back to the mysterious, but likely most noteworthy association or connection concerning Bulldogs and military football, one of the UGA legends I'm referring to is Heisman-winner Frank Sinkwich, who entered into the Marine Corps soon after receiving his coveted trophy and Georgia won the Rose Bowl. After getting a medical discharge, "Fireball Frankie" began his NFL career by earning first-team All-NFL with the Detroit Lions in 1943, and was then named MVP of the entire league in 1944. Returning to war, Sinkwich served with the Army Air Corps, playing football for the Second Air Force Superbombers in 1945. It was that year on October 14th, or ironically the day after Trippi was discharged by the U.S. War Department, that 25-year-old Sinkwich—a former Bulldog—and a 23-year-old "Bulldog to be" more than 20 years later would remarkably cross paths in Colorado Springs when the Superbombers hosted the El Toro Marines of California. 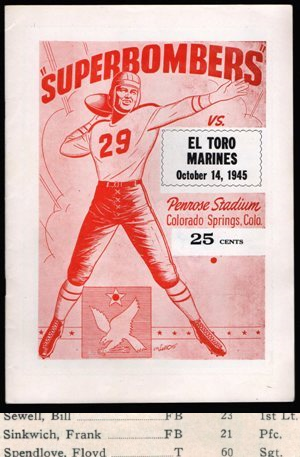 Featuring end Lafayette King, a little-used freshman on Georgia's varsity in 1942, but one who caught two touchdown passes for the Bulldogs that season totaling more than 100 yards, the Marines were routing the Superbombers during the third quarter when Sinkwich was badly hurt, tearing cartilage in his knee. And, our mystery "Bulldog to be" was there to witness the unfortunate injury, broadcasting the great Sinkwich getting carried off hurt during what is believed to be the first-ever radio broadcast for the future Bulldog. Sinkwich missed the remainder of the 1945 season, and although he would return to the NFL, he played in just 15 combined games with New York and Baltimore before retiring after the 1947 season. 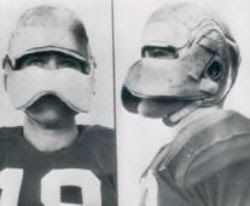 Sinkwich would later indicate that the knee injury he suffered in Colorado Springs in 1945—one requiring two operations—was undoubtedly the reason for his short-lived professional football career. The Bulldog legend connected, so to speak, with Sinkwich and with serving our military was able to find work, as you can see in the image. 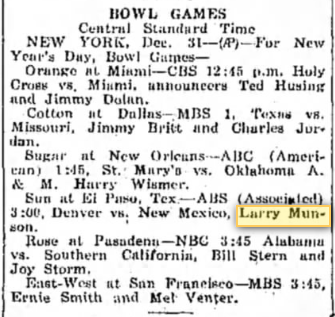 Although Second Air Force football consisting of college standouts ended with the 1945 season, the young broadcaster was hired to call the Sun Bowl in El Paso, broadcasting for the Associated Broadcasting System (ABS) on January 1, 1946. 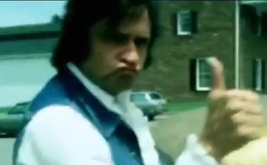 The ABS Network and its 23 affiliates would fold less than four months later, but as we're all aware, the eventual-Bulldog dignitary was certainly able to continue his broadcasting career. 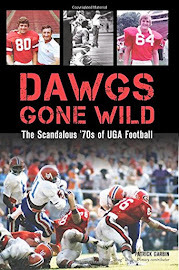 On a historical date in UGA football history during what should be a memorable phase of the program, and not one overlooked by the program itself, the career of a legendary Bulldog in Frank Sinkwich unfortunately essentially ended, while the career of a legendary Bulldog-to-be, Larry Munson, was just beginning.